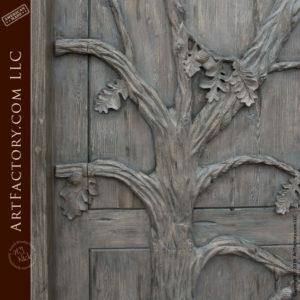 Nature lovers rejoice, order your very oak tree theme custom door from ArtFactory.com. 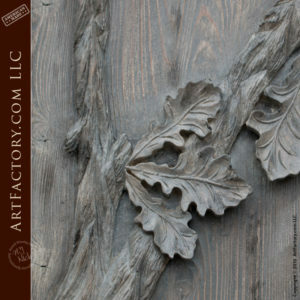 Share your love nature with the world by greeting them at hand carved custom door. All of our doors are handmade by master craftsmen from thick, solid, full length timber. This door features a medium brown finish. This is just one of the over 400 designer stain colors we have to choose from, or we can match to the color of your choice. We construct all of our doors with the same materials and techniques, that have been used to build castle and fortress doors for centuries. This type of construction ensures that you will have a door that is built to stand the test of time. 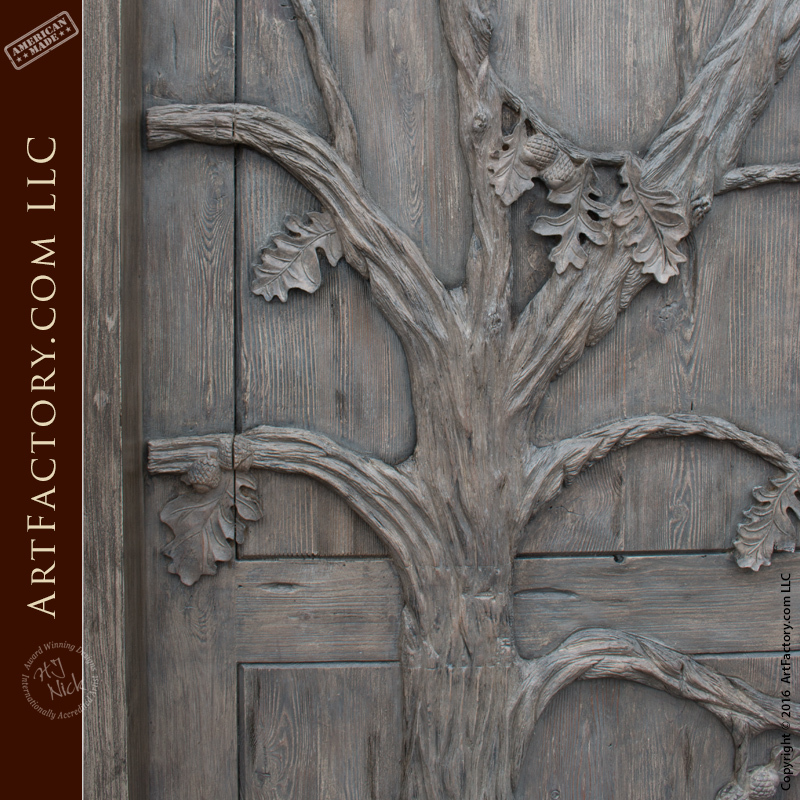 Our master carvers create detailed artwork such as this oak tree theme custom door by using the process of direct carving. This means, "by one master’s hand only”. We never utilize gang carving or CNC machines. Each door is painstakingly carved to world class fine art specifications. Most importantly, our high relief hand carving process creates both positive and negative levels such as carved our undersides of leaves. This type of detail cannot be reproduced by any machine. In addition, award winning artist H.J. Nick supervises the construction of each product to ensure that each item is built to world class fine art specifications. Each item is certified as fine art with the H.J. Nick signature before it ever leaves our factory. The oak tree theme custom door features our popular oak leaf door pull (HH190A) with a black patina finish. 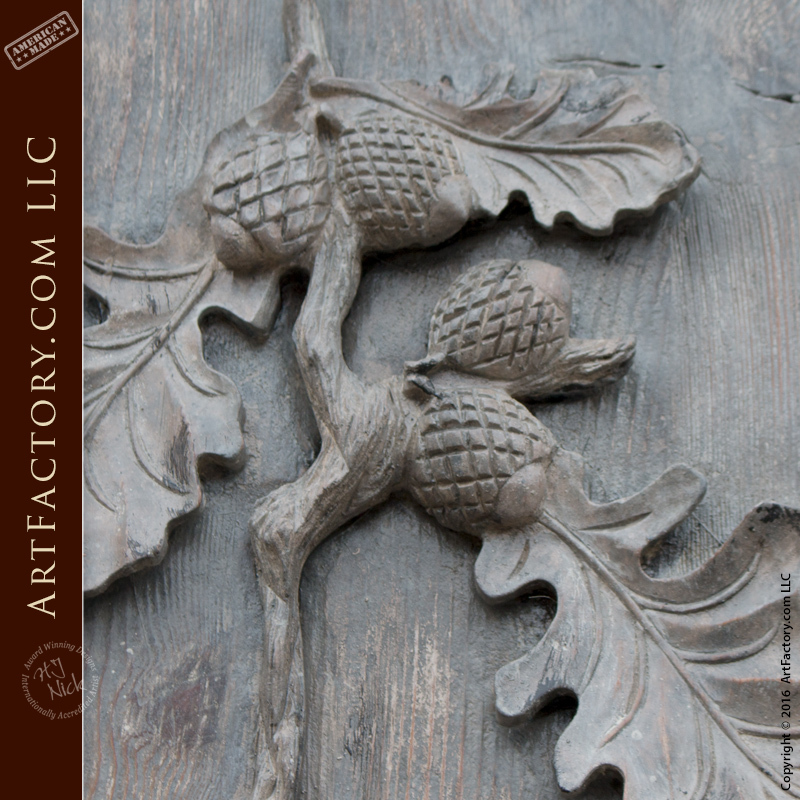 The custom, fine art, oak leaf, door pull is accented with a pair of acorns at the top of the leaf, and has a black patina finish. We use a hand applied, advance patination process one all of our hardware products. The proprietary process infuses the iron oxide patina to the metal at over 1000 degree Fahrenheit. This process makes for long lasting color that won't crack, flake, and chip like paints and powder coats. This process advances the metal's natural patination process, thus allowing for a product that will look beautiful from day one, and will age gracefully with little or no maintenance. 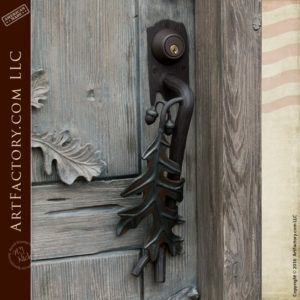 Furthermore, we craft all of our custom hardware in solid, hand forged wrought iron. Our master blacksmiths use hammer and anvil to build wrought iron door hardware that is always solid, never hollow, for unmatched durability. We use wrought iron because it lasts for centuries, and does not corrode with exposure to the elements like cheap filler metals. We also never using casting, drop forging, build from a mold, or use any type of fast or mass production process. This makes for a fine art quality product that is uniquely yours, and will never be exactly reproduced. First of all of our custom entrance doors provide maximum security. Additionally, we build to investment quality and fine art standards. We can build and of our custom door designs for either your residential, or commercial property. All doors are pre-hung in a structural solid wood jamb that can be mounted to a typical metal store front. We can also make any of our custom door designs into custom gates or custom garage doors. Make a proper first impression that reflects your personality and accomplishments in the same way kings, queens, and other aristocracy have done for thousands of years. 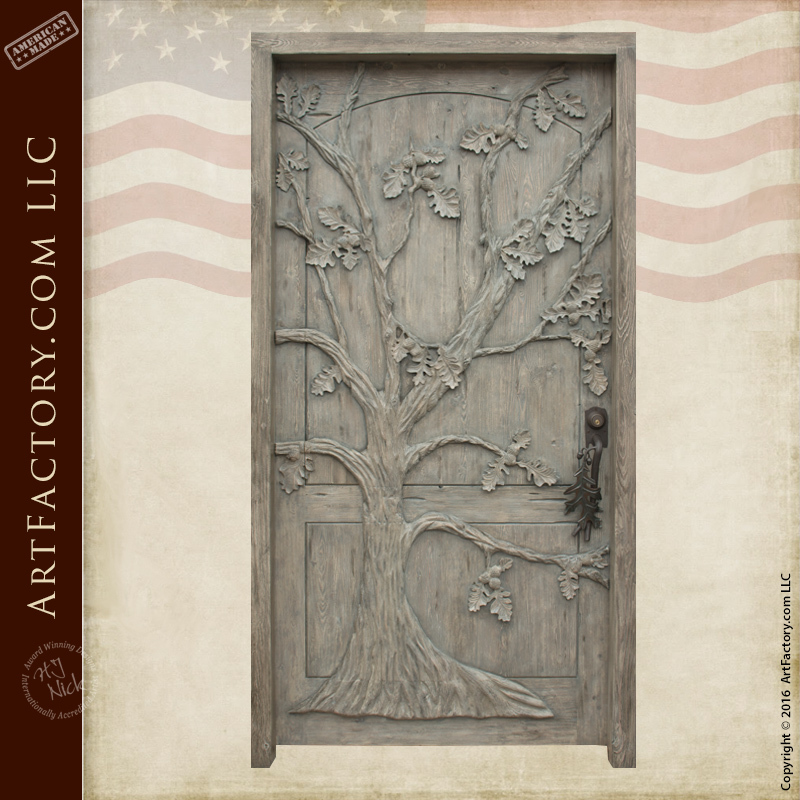 Request a quote for your dream oak tree theme custom door today, by calling 1-800-292-0008 to speak with one of our engineers.